doz ideas: The Archbishop of Canterbury: Pray For Peaceful Elections In Nigeria. 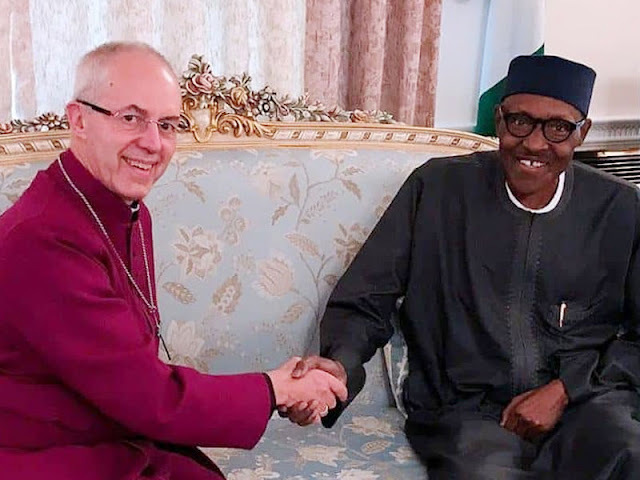 The Archbishop of Canterbury: Pray For Peaceful Elections In Nigeria. When some people are asked to pray to God for their needs, and other people don’t pray to God for their needs, yet their needs are supplied, confirms the adage: "as you make your bed, so you must lie on it." The Archbishop of Canterbury, Justin Welby, advised Christians in Nigeria to pray fervently for peaceful elections next year (2019). Mr Archbishop, in your country, United Kingdom (UK), do you pray fervently for peaceful elections? The answer is no. Then, why do you do think that prayer will guarantee peaceful elections in Nigeria when peaceful elections are conducted in the UK without prayers? On the day (usually Thursdays) of a general election in the UK, polling stations open between 7am and 10pm. No public holiday is declared because of elections. People go to work and vote at their spare time, and within the voting period. However, in Nigeria and the rest of Africa, religious people always ask Africans to pray for all their needs. They tell us to pray for our daily bread. In the UK, citizens don’t pray for daily bread, local council pays the unemployed unemployment benefit to enable him to buy his daily bread. If he’s homeless, he is provided with a free accommodation. If you have medical emergency in the UK, you don’t call your pastor or pray, you call an ambulance to take you to hospital. If you face a threat to your life, you neither pray nor call your pastor, you dial 999 for police and fire service to the rescue. But in Africa, they tell us to pray or call our pastors to heal or rescue us from dangers, including our housing needs. Mr Buhari, Nigerian president, sometime ago asked Nigerians to pray so that the killing of farmers by Fulani herdsmen would stop. Instead of arresting the perpetrators of these ungodly acts, Buhari wants God to intervene. Perhaps Mr Buhari wants God to come down from heaven and become a policeman to stop the killings. Pray for boko haram killings to stop. God will come down dressed as chief of army to defeat boko haram terrorists. Pray for Nigeria's economy to improve. God will come down and become the finance minister to implement the basics of demand and supply. Meanwhile when Qatar was vying to host the world cup, Europe and FIFA were concerned about Qatar’s temperature, which can be as high as 50 degree centigrade - whether the players would cope. Qatar’s response wasn’t that they will pray to have mild weather, but that they will airconditioned the stadium if the need be. And Qatar is a highly religious Muslim country. Since 1960 that Nigeria gained independence from Britain, the people have been praying and there’s nothing to show for their fervent prayers. Perhaps, their prayers are not heard because they have been praying to the European pagan god (‘sun god’ - son of god) that has no ears. And to the Arabian pagan god that is only interested in beheading people. Now, Mr Archbishop of Canterbury, we are tired of praying in Nigeria and Africa because these prayers don’t work for us. Nigerians have just one request. Mr Buhari is your friend. You knew him in the 70s when you were the financial executive director of ELF, French oil company. And Buhari was Nigeria’s minister of petroleum. Two of you controlled billions of dollars of oil revenue. You know what transpired between two of you that ensured your friendship lasted till today. I haven’t said that two of you looted Nigeria’s oil revenue, but only two of you can say that I am incorrect. And therefore, Mr Archbishop, we ask you to go and pray for your friend, president Buhari, so that your god will touch him to allow the Independent National Electoral Commission (INEC) to be truly independent. Let him also allow the Police, SSS, military, etc to be independent, That is the only way to guarantee free, fair and peaceful elections in Nigeria, and not your PRAYERS. Finally, Mr Archbishop, if you don’t pray for Britain to have free, fair and peaceful elections, please don’t come to Nigeria and Africa to pray for us to have peaceful elections. In Britain, all their institutions are truly independent, and that’s why they don’t pray to have peaceful elections. And that’s what we need in Nigeria, not PRAYERS, we have prayed enough. In fact, the more we pray in Africa the more things worsen.